Can you believe it’s so close to Christmas, already? Considering I started this year’s Christmas shopping in December 2014, you’d presume I’d be organised by now? Present wise, yes: I’ve been drip-buying presents throughout the year. However, they’re still waiting to be wrapped alongside the tree that’s waiting for decorations! The one thing that I have managed to be organised about is my Christmas Day outfit. It’s quickly becoming one of my favourite festive traditions: to plan a Christmas themed outfit using clothes and accessories already in my wardrobe. 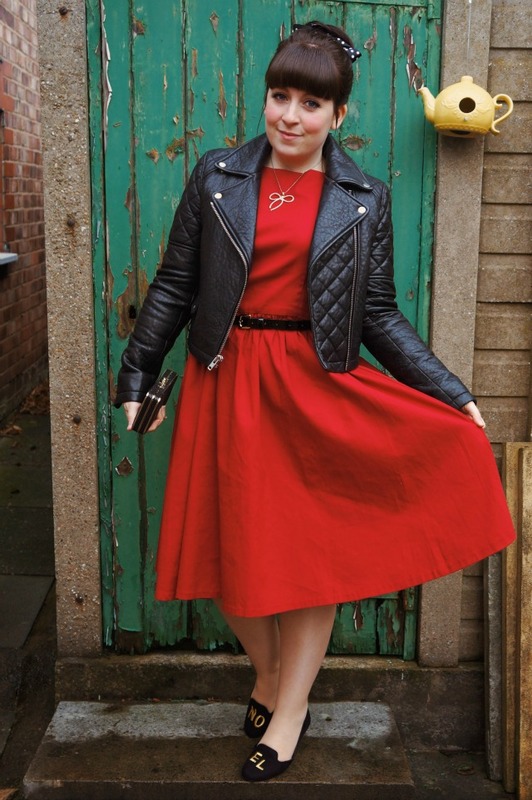 Last year, I wore this vintage dress with a thrifted Zara jacket. 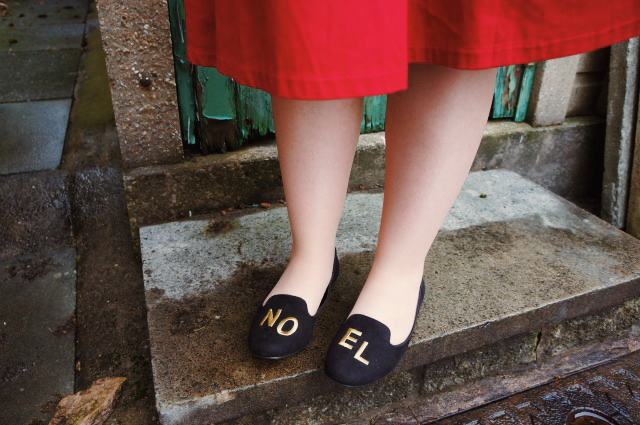 Whilst my ‘NOEL’ loafers are new, I did buy them in the January sales with a voucher for the bargain price of £7. At Christmas, John and I usually split the day between Burnley and St Helens. Even though we spend the day at our families’ houses, I still like to make an effort. 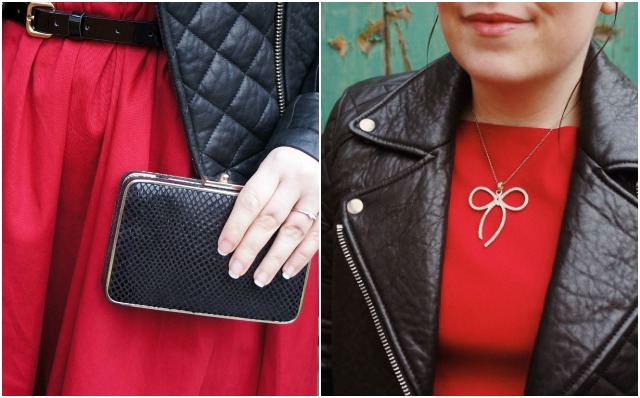 My mum still wonders why I ‘go through the stress of planning an outfit for Christmas day’ but I built a blog around capturing my favourite outfits, so why not? Apart from the shoes, everything in this outfit was already in my wardrobe. With money being so tight at the moment, I’m not buying accessories, jewellery or handbags. I just can’t justify spending money on them but that doesn’t mean I don’t love wearing them, after all they can make an outfit! 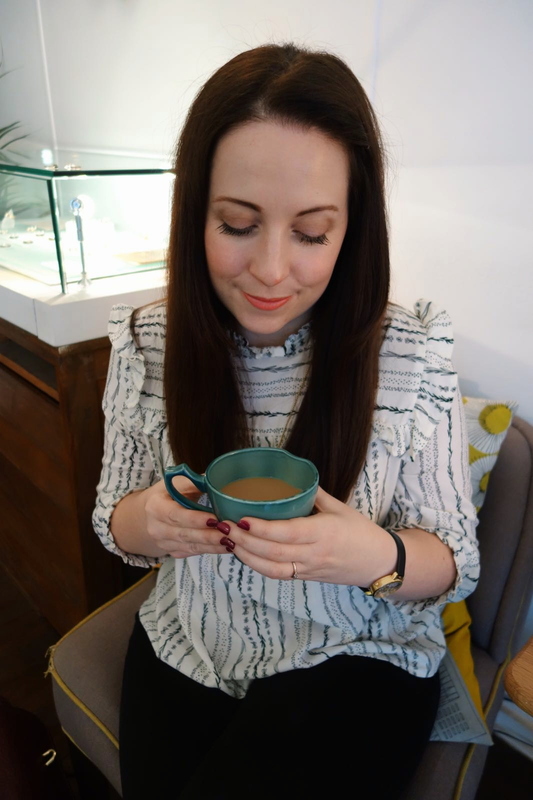 I have ideas bubbling in my head for an online blogger swishing party. Fancy it? 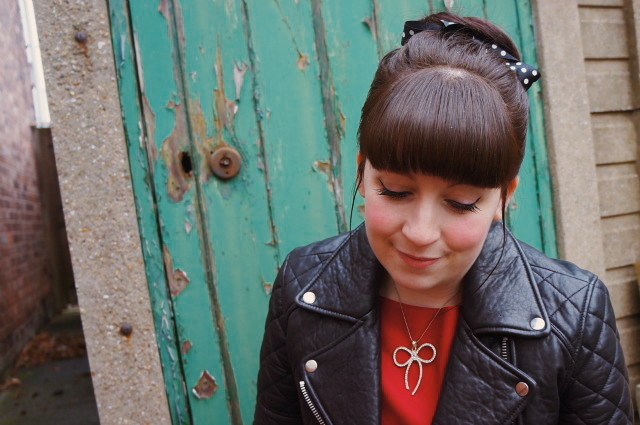 The accessories in this outfit are hand-me-downs, sale buys and Christmas wrapping! As I mentioned, my Christmas themed outfits are built around clothes I already have. During the summer that I worked at Lindy Bop, I picked up quite a collection. 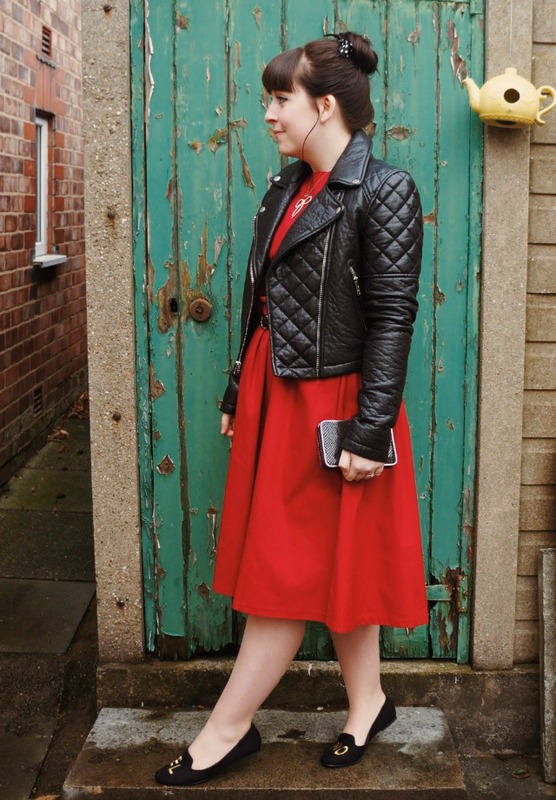 Although I do champion their dresses, my favourite piece has to be their ‘Rizo’ leather jacket. Since my last jacket wore out, I’d been searching for the perfect ‘leather’ jacket. Then Rizo waltzed into my life with all the sass you’d expect. She’s the perfect length for wearing with dresses and sits neatly on my waist! At almost £130, Rizo is definitely an investment piece but she fits perfectly and keeps me warm. What more could I ask for?